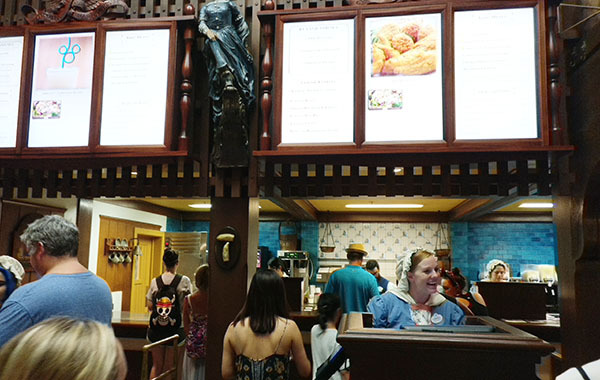 When it comes to Magic Kingdom dining, there isn’t a great selection anywhere. 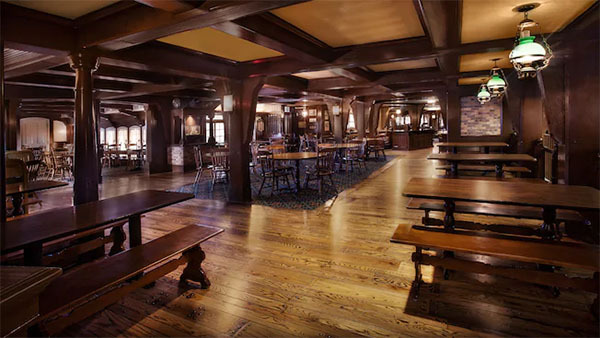 Be Our Guest is the only standout restaurant, and while Gaston’s Tavern used to be a solid second choice, they eliminated the pork shank there making it less than a snack stop. Your other choices boil down to a mexican salad bar, or pizza. 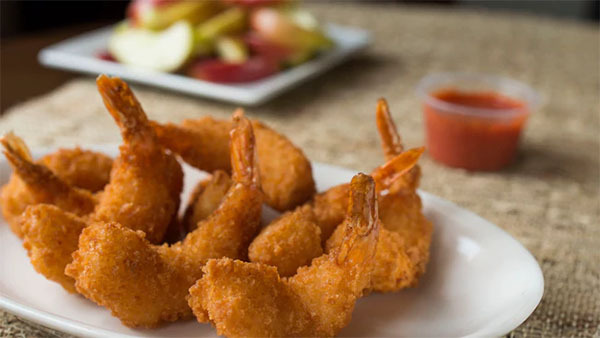 For quick service, Columbia Harbor House is a solid choice. 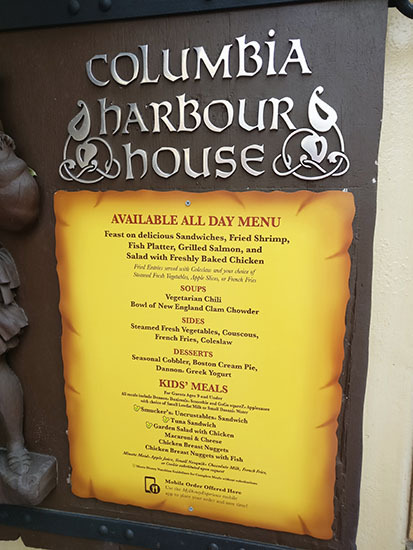 Columbia Harbor House is themed after a colonial Boston harbor restaurant. The castmembers are outfitted in Puritan clothing with bonnets, petticoats, jerkins and doublets. It’s only natural that they serve seafood. 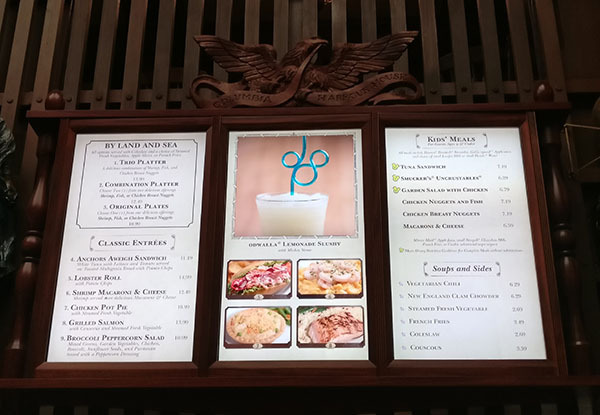 The restaurant is located in Liberty Square, just down from the Haunted Mansion heading towards Adventureland. The exterior looks straight out of Switzerland, but rest assured, this is colonial America. They do have bathrooms inside the restaurant, which is a nice touch. The menu offers fish and chicken. Fish strips, chicken strips, and fried shrimp all come in the combination platter. Alternatively, you can order them separately. There is also a chicken pot pie, several salads, and a lobster roll. In additional to soda, they offer a lemonade slushy. Dessert includes a cobbler, and what else, but Boston Creme Pie! It’s edible, but it’s not particularly good. It’s not a restaurant that you will crave, or hope to come back to on your next visit. It’s also not one that will make you pray that Magic Kingdom puts something else in it’s place. 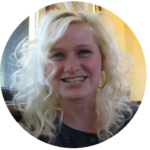 ► For Kids: If your kids love chicken nuggets and french fries, this is the place for you. Magic Kingdom is the most visited Theme Park in the entire world. I suppose that when people come to a theme park they expect a bunch of fried terrible food, and Disney definitely delivers. But, it’s such a shame to me. 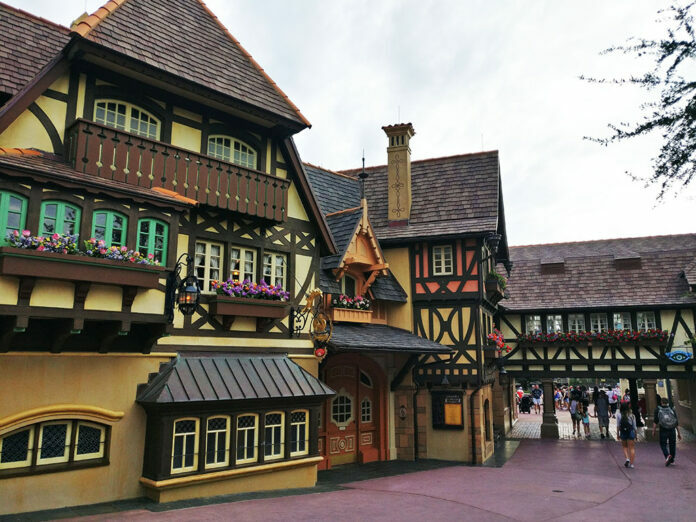 Animal Kingdom, Epcot, and the Kingdom’s many resorts offer a remarkable selection of dining choices, but Hollywood Studios and Magic Kingdom offer next to nothing magical to stuff in your face. Where is your favorite place to eat in Magic Kingdom? We’d love to hear your review! ► Nap-Time Version: Columbia Harbor House is one of the less terrible quick service food choices in Magic Kingdom. Check out our review of Cinderella’s Royal Table, and Be Our Guest, and don’t miss out on our full Table of Contents of Walt Disney World Restaurants.